Niagara on the Lake is a charming, historic town in Ontario Canada which is very close to Niagara Falls. This pretty little town is the perfect place to base yourself for a visit to the greater Niagara Falls region. Explore the forts, mansions, gardens and parks in Niagara Ontario and then check out the many other attractions nearby. In the War of 1812, this town was taken by American forces after a bloody battle and burnt to the ground. The citizens rebuilt the town after the war. St. Mark's Church - built in 1804-09, burnt in the War of 1812 (used for hospital during war)....check out the interesting burial ground (tombstones from early 19th century). Fort George - built by British 1796-1799 to guard entrance to Niagara River....most buildings have been restored and furnished as they were in early 1800's. Shaw Festival Theatre - plays by George Bernard Shaw presented from April - Oct.
Niagara Historical Society - houses over 20,000 artifacts on history of area. Court House - bell has rung every hour since March 27, 1839. Niagara Apothecary - 5 Queen St., built in 1819, continued use until 1971 (longest operating pharmacy in Ontario)....now is a historical Pharmacy Museum. Niagara on the Lake Golf Club - oldest golf course in North America set on the shores of Lake Ontario. Lanternlit Ghost Walk - stroll through history and hear tales of haunted inns, pubs and homes. Niagara on the Lake Wineries - because of the escarpment, the area has a great climate for growing grapes. Two recommendations are Hillebrand and Peller Estates Wineries. 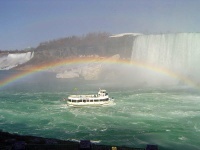 Make sure and check out the other nearby attractions at Niagara Falls. The Maid of the Mist Tours which actually take you in a boat up to the Falls includes rain ponchos because you are guaranteed to get wet! Enjoy nature at the Botanical Gardens and Butterfly Conservatory, a great place to explore. Prince of Wales Hotel - Victorian elegance, genteel, luxury hotel with spa...enjoy "High Tea". Harbour House Hotel - Ph. 1-866-277-6677, perfect for a romantic weekend getaway, some rooms with fireplaces, expensive. The Charles Inn - luxurious Georgian style Manor House, historical themed rooms. Hilton Garden Inn - Ph. 905-984-4200, moderate priced hotel, breakfast included. Check out these B&Bs for a wonderful romantic Niagara getaway or Niagara honeymoon. Abacot Hall Bed and Breakfast - great hosts, personal touches, delicious breakfast, reasonable rates. Brockamour Manor - Ph. 905-468-5527, Georgian Estate B&B historic and elegant, generous breakfast. For a special occasion or romantic fine dining check out Escabeche at the Prince of Wales Hotel. Check out the fried goat cheese and rack of lamb. Delicious Asian food can be found at Ginger. The prices are reasonable and the menu covers food of several different countries and cuisines. For a fun meal, check out Zee's Patio and Grill. This busy restaurant serves good food in a unique atmosphere. The Pie Plate is a great casual restaurant with delicious food...homemade breads and desserts. It is the perfect place for lunch.